Ножны кожаные для ножа купить ножны кожаные для ножа cheburkov.com/catalog/nozhny. George Herman Ruth, (February 6, 1895 – August 16, 1948), better known as Babe Ruth and also commonly known by the nicknames The Bambino and The Sultan of Swat, was an American baseball player and United States national icon. He was one of the first five players elected to the Baseball Hall of Fame and he was the first player to hit over 30, 40 and 50 home runs in one season. 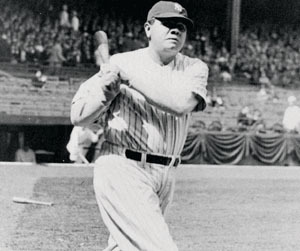 In 1998, The Sporting News named Ruth as Number One in its list of "Baseball's 100 Greatest Players". As discussed in the 1988 book, The Babe: A Life in Pictures, by Lawrence Ritter and Mark Rucker, it is more than mere statistical records that make Babe Ruth unequivocally the greatest baseball player of all time. In several ways, he changed the nature of the game itself. His exploitation of the "power game" compelled other teams to follow suit, breaking the monopoly of the "inside game" that had been the primary strategy for decades. Ruth was the focal point of the start of what has become statistically the greatest sports dynasty in history, the New York Yankees. His international fame helped fuel the rising interest in sports during the Roaring Twenties as the fan base expanded significantly and triggered major expansion of nearly all the ballparks in the major leagues. Ruth was born at 216 Emory Street in south Baltimore, Maryland. The house was rented by his maternal grandfather, Pius Schamberger, a German immigrant who eked out a living as an upholsterer. Babe's parents, Kate and George Sr., lived above the saloon they owned and operated on Camden Street. Kate would walk to her father's home each time she gave birth to a child, eight in all. Only Babe and his sister, Mary, survived infancy. Young George was known for mischievous behavior. He skipped school, ran the streets, and committed petty crime. By age seven, he was drinking, chewing tobacco, and had become difficult for his parents to control. Mary recalled how their father would beat Babe in a desperate attempt to bring the boy into line, but to no avail. He was finally sent to St. Mary's Industrial School for Boys, a school run by Catholic brothers. Brother Matthias, a Roman Catholic priest, and the school's disciplinarian, became the major influence on his life, the one man Babe respected above all others. It was Brother Matthias who taught him baseball, working with him for countless hours on hitting, fielding and later, pitching. Because of his "toughness", George became the team's catcher. He liked the position because he was involved in every play. One day, as his team was getting pounded, Babe started mocking his own pitcher. Brother Matthias promptly switched George from catcher to pitcher to teach him a lesson. But, instead of getting his comeuppance, Babe shut the other team down. Brother Matthias brought Babe to the attention of Jack Dunn, owner and manager of the minor-league Baltimore Orioles, and the man often credited with discovering him. In 1914 Dunn signed 19-year-old Ruth to pitch for his club, and took him to spring training in Florida, where a strong performance with bat and ball saw him make the club, while his precocious talent and childlike personality saw him nicknamed "Dunn's Babe". On April 22, 1914 "The Babe" pitched his first professional game, a six-hit, 6-0 victory over the Buffalo Bisons, also of the International League. By July 4, the Orioles had a record of 47 wins and 22 losses, 25 games over.500; but their finances were not in such good shape. In 1914 the breakaway Federal League, a rebel major league which would last only 2 years, placed a team in Baltimore, across the street from minor league Orioles, and the competition hit Orioles' attendance significantly. To make ends meet, Dunn was obliged to dispose of his stars for cash, and sold Ruth's contract, with two other players to Joseph Lannin, owner of the Boston Red Sox, for a sum rumored to be between $20,000 and $35,000, although some sources say it was closer to $3000. Though Ruth was a skillful pitcher, the Red Sox's starting rotation was already stacked with lefties, so they initially made little use of him. With a 1-1 record, he sat on the bench for several weeks before being sent to the International League with the Providence Grays of Providence, Rhode Island. Pitching in combination with the young Carl Mays, Ruth helped the Grays win the pennant. At the end of the season the Red Sox recalled him, and he was in the majors permanently. Shortly afterwards, Ruth proposed to Helen Woodford, a waitress he met in Boston, and they were married in Baltimore on October 14, 1914. During spring training the next season, Ruth secured a spot as a starter. Ruth joined a fine pitching staff that included Rube Foster, Dutch Leonard, and a rejuvenated Smokey Joe Wood, and their pitching carried the Red Sox to the pennant. Ruth won 18 games and lost 8, and helped himself with the bat, hitting.315 and slugging his first four major league home runs. The Red Sox won the 1915 World Series, defeating the Philadelphia Phillies 4 games to 1, but because manager Bill Carrigan preferred right-handers, Ruth did not pitch and grounded out in his only at bat. In 1916 he returned to the rotation, although the team's offense had been weakened by the sale of Tris Speaker to the Cleveland Indians. After a slightly shaky spring, he would make a case as the best pitcher in the American League. He went 23-12, with a 1.75 ERA and 9 shutouts, the shutout mark is still tied for the best mark for an A.L. left hander, as well as the current Red Sox record for shutouts in a season. Pitching again took the light-hitting Sox to the World Series, where they met the Brooklyn Robins. In game 2 of the series, Ruth pitched a 14-inning complete game victory, helping the Red Sox to another World Series title, a 4-1 series win over the Robins. He repeated his strong performance in 1917, going 24-13, but the Red Sox could not keep pace with the Chicago White Sox and their 100 wins, and they missed out on a third straight postseason appearance. After the 1917 season, in which he hit.325, albeit with limited at bats, it was suggested Ruth might be more valuable in the lineup as an everyday player. In 1918, he began playing in the outfield more and pitching less. His contemporaries thought this was ridiculous; former teammate Tris Speaker speculated the move would shorten Ruth's career, but Ruth himself wanted to hit more and pitch less. In 1918, Ruth batted.300 and led the A.L. in home runs with 11, despite having only 317 at bats, well below the total for an everyday player. He also pitched well, going 13-7 with a 2.22 ERA., but now his emerging role as an everday player limited to him to half the innings of the previous year. Ruth had excelled at the double duty work, and he could make a case as the best player in the 1918 season. Additionally, he led the Red Sox to another World Series, where they met the Chicago Cubs. The 1918 baseball season is noted as the only time a war directly shortened the season. World War 1 dominated the news, and baseball, which escaped sacrifice in 1917, was not as fortunate in 1918. A number of ballplayers were drafted into the armed forces in 1918, and some players dropped their bats and gloves and went to work in war production facilities to escape the draft. Since he was married, Ruth was exempt from the draft. After U.S. Provost Marshal General Enoch Crowder issued his famous "Work or Fight" order in June of 1918, baseball, qualified by the government as nonessential, was forced to end the season in the middle of August. A two-week grace period was allowed for the World Series, but the series was played in the heat of early September, the earliest the series has ever been played. The 1918 World Series would be marred by not only the specter of World War 1, but by abysmal attendance and such low revenue sharing that players threatened to strike before game 5 of the series. In the series, Ruth the pitcher went 2-0 with a 1.06 ERA, helping the Red Sox to a 4-2 series victory over the Cubs. During the series, Ruth extended his World Series consecutive scoreless inning streak to 29 2/3 innings (a record that lasted until Whitey Ford broke it in 1961). Since the Cubs top left handers James Vaughn and Lefty Tyler pitched nearly all the innings, Ruth's left hand bat was kept him from the regular lineup, and he batted just 5 times. The Red Sox had won their fourth World Series in seven years, and fifth overall, and Ruth had played a major part in three of series titles. Since the 1903 inception of the World Series to 1918, the Boston Red Sox were the most successful franchise in major league baseball. By 1919, Ruth was basically a fulltime outfielder, pitching in only 17 of the 130 games in which he appeared. He set his first single-season home run record that year, hitting 29 home runs, breaking the previous record of 27 set by Ned Williamson in 1884, in addition to batting.322 and driving in 114 runs. News of his batting feats spread rapidly, and wherever he played large crowds turned out to see him. As his fame spread, so did his waistline. Since his time as an Oriole, teammates had marveled at Ruth's capacity for food, and by 1919 his physique had changed from the tall athletic frame to more of a rotund shape, although Ruth's weight would have wide flucuations until the mid-1920's. Beneath his barrel shaped body, his powerful muscular legs seemed strangely thin, but he was still a capable base-runner and outfielder. His contemporary Ty Cobb, noted for his cruel bench jockeying of Ruth, would later remark that Ruth "ran okay for a fat man". Despite the box office appeal of Ruth, the Red Sox were in a perilous financial position. After he took over the club in 1916, Red Sox owner Harry Frazee had paid large salaries to attract the best players (some even accused him of trying to buy the pennant). But due to World War I, the Red Sox attendance, as in every other major league city, fell off badly in 1917 and 1918. Revenue was down, and the financial failure of the 1918 World Series did not help Frazee either. Frazee, whose true passion was the theater, owned his own theaters and financed his own shows, but recently his shows were also losing money. Having overextended himself financially, Frazee was desperate for cash, and his players were his only source of money. After the Red Sox championship run from 1912 to 1918 ended with a crash-the 1919 team finished 66-71, Frazee began selling off his best players. Frazee sold many of these players to the New York Yankees, until then, a perennial second division club. After his record setting season in 1919, Ruth made it clear he wanted his salary doubled from $10,000 to $20,000 a year. Knowing he could never meet Ruth's demands, Frazee worked out a deal with Yankees owner Jacob Ruppert. For a sum of $125,000 and a loan of more than $300,000 (secured on Fenway Park itself), Ruth was sold to the Yankees on January 3. "It would be impossible to start next season with Ruth and have a smooth-working machine. Ruth had become simply impossible, and the Boston club could no longer put up with his eccentricities. I think the Yankees are taking a gamble. While Ruth is undoubtedly the greatest hitter the game has ever seen, he is likewise one of the most selfish and inconsiderate men ever to put on a baseball uniform". From 1920 to 1934, Ruth's tenure as a Yankee, the Boston Red Sox were the worst team in the American League. During this span they finished last 10 times, never finished above 5th place, and they had no winning season until 1935. After they sold Ruth, the Red Sox struggled to win even a single World Series until 2004, contrasted with the Yankees overwhelming success in that venue, led to a superstition that was dubbed the "Curse of the Bambino". Almost immediately, Ruth began to pay off on his investment. He trained extensively over the winter, and in 1920 turned up at spring training in fine condition. When the season started, it was clear that the more hitter-friendly Polo Grounds suited him, and Ruth's 1920 season turned into one that no one had ever come close to seeing before in baseball. He hit 54 home runs, smashing his year-old record, batted.376, and led the league in runs (158), RBI's (137), walks (148), and his slugging average of 847 was a major league record for over 80 years (Barry Bonds eclipsed it with a.863 mark in 2001). Ruth's season was so dominating it led to one of the most amazing statistics in baseball history. In 1920, Ruth out-homered all but one team in baseball, as only the Philadelphia Phillies with 64 hit more home runs than Ruth. Ruth's remarkable season had the Yankees in a serious pennant chase for the first time since 1904 (the year a famous wild pitch by Jack Chesbro cost them the pennant). The Yankees battled the entire season with the Cleveland Indians, player-managed by Tris Speaker, Ruth's old Red Sox teammate, and the Chicago White Sox, the same infamous "Black Sox scandal" team, but in the end, the Indians won the pennant and eventually the World Series. Ruth's impact on baseball went well beyond his statistics. Attendance, which had stagnated in the 1910's, greatly increased due to the attention Ruth brought to the game, and he was at the forefront of the new live ball era that revolutionized how the game was played. A few baseball people even gave Ruth credit for "saving" baseball after the Black Sox scandal broke in the fall of 1920, and although this was not true, Ruth's exploits on the field likely won back some fans who had been soured by the scandal.